Nifty option is a derivative trading tool to trade Nifty – a very popular Stock Market Index in India. 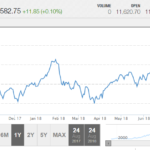 The CNX Nifty, also called the Nifty 50 or simply the Nifty, is National Stock Exchange of India’s benchmark stock market index for Indian equity market. Nifty is owned and managed by India Index Services and Products (IISL), which is a wholly owned subsidiary of the NSE Strategic Investment Corporation Limited. IISL had a marketing and licensing agreement with Standard & Poor’s for co-branding equity indices until 2013. The ‘CNX’ in the name stands for ‘CRISIL NSE Index’. Nifty option behaves just like any stock option. Nifty option also has a lot size and other factors like call and put options, different strikes to trade and of course time limit to expiry. What is the Current Lot Size of Nifty Option? Right now its 25. But till October 30, 2014 the lot size was 50. This was the expiry day of the October 2014 series. From the very next trading day, that is October 31, 2014, the lot size was reduced to 25. In the year 2015 Nifty increased its lot size to 75. The lot size of CNX Nifty in the futures & options (F&O) segment has been revised upwards to 75 from the current 25. The lot size of CNX Bank index (Bank Nifty) has been hiked to 40. The changes in the lot size will take effect from 28 August 2015. Contracts with maturity of September 2015 and October 2015 will continue to have the existing market lots until the expiry of F&O contracts for these two months. Why Nifty Lot Size was Reduced from 50 to 25? Note that unlike stocks, Nifty does not have any shares in the stock market. 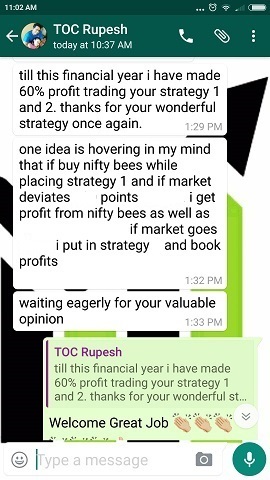 If you want to own Nifty shares you can buy Nifty BeES. More information here. Just like shares of a company you can hold them and sell whenever you want. 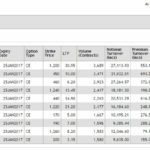 Nifty BeES does not expire, and is a great product for someone who wants to accumulate Nifty shares and not shares of a particular stock. Nifty BeES, technically is not a share, its the first ETF (Electronic Trading Fund) in India. So you own a part of a fund, not shares of Nifty. Of course Nifty BeES mimics Nifty. So if you buy Nifty BeES when Nifty was at 6000 and sold it when Nifty reached 8000. Your total profit would be 33.33%. Similarly you do not own any share when you buy/sell an option or future, you are just leveraging cash to take a business risk. Everything is cash settled on or before expiry. For example, when you buy one lot of Nifty future – it means you have bought an equivalent of 25 shares of Nifty. Same is the case with one lot of Nifty Option. If you bought Nifty Future at 8000 and sell it at 8300 – you make 8300-8000 = 300*25 = Rs. 7500.00 profit. 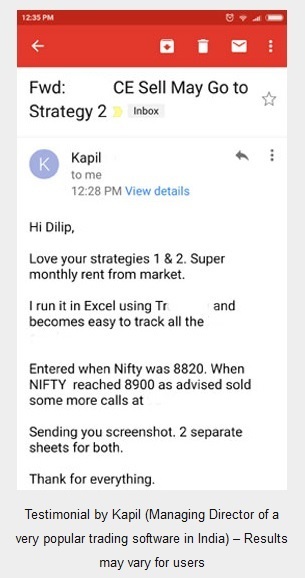 However if you bought a call option of Nifty when Nifty was at 8000, and Nifty increases by 300 points you may not make Rs. 7500.00. It will be slightly less depending on the premium of the option you bought. This is because the person who bought Future is at unlimited risk if Nifty falls down, however a person who bought Nifty option is at limited risk of the premium he paid to buy the option. So why should they make the same profit for the same movement? If the losses are more the profits should also be more. Can you see the benefit of trading in options? Though in my experience option buyers usually lose money. Here are some more benefits of trading Nifty options. First just like any other stock you have choice of two options – call option and put option. If you think Nifty may go up you should buy call option, and if you think Nifty will fall you should buy put option. Why? Because the value of the call option will rise if Nifty goes up, and similarly value of the put option will rise if Nifty goes down. You can also sell these options. You should sell a call option if you think Nifty may go down, and you should sell a put option if you think Nifty may go up. In technical terms – the buyer of the call option is long call and the seller of the call option is short call. Similarly the buyer of a put option is long put, and the seller is short put. 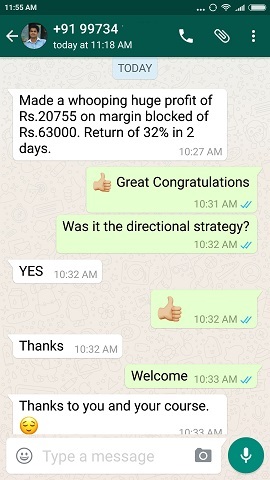 When you sell a call option and Nifty goes down, the option premium will get reduced, then you can buy back your option at a profit. However what happens when you are wrong and Nifty keeps going up after you have sold a call option? You are at unlimited risk, because you don’t know where the Nifty bull run will end. In that case you must take a stop loss or hedge your position. Similarly if you have sold a put option and Nifty continuous its slide downwards, you are again at unlimited risk as the put option will keep rising. Here too you must buy back your options to limit your losses. No it does not mean that you will not make a loss if you buy an option – you will make a loss if your view goes wrong whether you buy or sell an option. The only thing is whatever you do you should be ready to take a stop loss if your views have gone wrong. Whatever you do you will be required to pay a margin. When you sell an option depending on which option you are selling and the current volatility – your margin may differ from 13,000 to 15,000 for one lot. The more risky the option, the more margin you pay. When you buy an option you only pay the premium and that’s your only risk. Interestingly you would have realized almost the same profit had you sold one lot of put option at 8000 and bought it back at 8100 – but (very important) if enough time passes away then the call option buyer may realize a small profit, but the put seller may gain a lot of points. In fact if on expiry day Nifty is at 8100, the call buyer will lose money because the value of the 8000 call option will be 100. The trader bought it for 150, and now he has to sell it for 100 for a loss of 50 points. However the put will expire worthless and the put seller can keep all the premium he got for selling the put. This is the main reason why option buyers find it hard to make money. BUT if Nifty falls, the call buyer will only lose the money he paid to buy the 8000 call, however the put seller will be at unlimited loss. Now after reading all this you must be thinking that selling an option is unlimited risk and buying an option is limited risk so one must buy an option. Well unlimited risk is only on paper. If you have a stop-loss in system it will take care of itself. And its the same with buying options. One thing I forgot to mention is that when you sell an option, you get a premium the very next day in your account. If your observation was right you can keep the entire premium and that’s your profit. Yes profit in selling an option is limited to the premium received and losses are unlimited. When you buy an option the risk is the premium you paid and profits are unlimited. However you make money only if Nifty moves in the direction you predicted, else you may lose money. It is therefore very hard to say if buying an option is better or selling is better. In both the cases to win, your viewpoint must be right or else you may lose money. Nifty options can be bought for the near month and for the next month. From the next-to-next month onward, the liquidity starts to fall. And that is a problem because you may not get a call or a put at the rate that you desired because there may not be enough sellers or buyers. Therefore its advisable that you play in current and/or next month options only. Remember that time value effects most in the near month (current month) options. Therefore some people buy next month options to beat time value. It all depends on what you want to do with options. If your view is only for the day (intraday) its better to buy near month options as their value changes fast and you should get the value you were looking for. However if you have taken a risk with two months in mind you should buy/sell the next month options as you will have enough time to realize a profit. So what you do? Do you sell options or buy options? 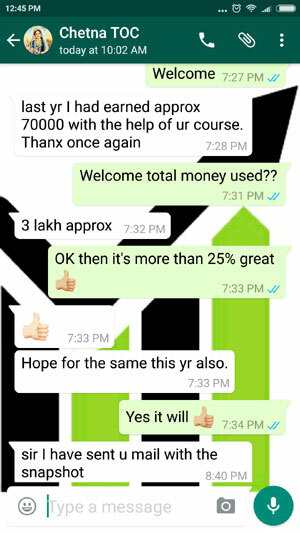 Whenever you do, if you are losing money trading options you can do my conservative option course to make 2-3% average per month trading options with very high success rate and very low risk. Introduction to Options trading can’t be made simpler than this IMHO. Highly recommended for all the newbies to Options trading. Next post: Why Should You Trade in Nifty Options?